Does anyone know why Fitchburg and Lowell do not have full high level platforms? Fitchburg especially is on a track specifically built for the station -- it is even called the Fitchburg Station Track. In Lowell, tracks 3 and 4 prohibit freights in the passenger station (plus the switches at CPF LO have been spiked to prevent through-movements) and as such are also defacto station tracks. These station aren't terrible old, but despite predating modern ADA law, I don't see much benefit to avoiding a high level. Especially Lowell, which is #3 in ridership for the entire commuter rail system. Lack of money. 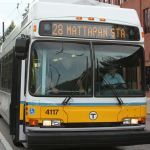 As those stations are already ADA-compliant and work fine as-is, the T has higher priorities for its limited budget. Fitchburg was only redone around 2005 when the garage was built. Since Lowell is a terminal, it won't negatively affect dwell time. And since they're both on freight clearance routes, the surrounding stations will never have full highs, so it's not even a power door convenience thing. Newtonville through Framingham, Waltham, Beverly, Hyde Park, Canton Junction through South Attleboro, and Fairmount and Readville are all higher on the need scale than Fitchburg or Lowell. Fitchburg might be worthwhile if Wachusett does pull good ridership, and Lowell if a NH extension ever happens. BostonUrbEx wrote: Does anyone know why Fitchburg and Lowell do not have full high level platforms? Fitchburg especially is on a track specifically built for the station -- it is even called the Fitchburg Station Track. In Lowell, tracks 3 and 4 prohibit freights in the passenger station (plus the switches at CPF LO have been spiked to prevent through-movements) and as such are also defacto station tracks. These station aren't terrible old, but despite predating modern ADA law, I don't see much benefit to avoiding a high level. Especially Lowell, which is #3 in ridership for the entire commuter rail system. Lowell was built in 1983 when the only full-highs that existed on the commuter rail were Malden Ctr. and Oak Grove, which were only built that way to facilitate future Orange Line conversion. That long ago there was no set specification on how to do one, so they more or less made it up as they went along and built Lowell with that weird half-high/half-low. No sense attempting to explain today a design decision that was finalized 10 years before the ADA and a good 8 years before the T's next attempt at a commuter rail full-high. '83 was still deep in dark ages for accessibility design and consistency therein. Fitchburg's current platform was 2002-construction, which was before the state-level accessibility laws were significantly tightened in '05. Back then there still was wiggle room to opt out of a full-high, unlike now where it's an ironclad requirement except when a freight clearance route offers absolute zero plausible alternatives. I'm guessing re: Fitchburg that they were leery of platform gaps around the curve and opted for the design certainty of mini-high. 3 years later they wouldn't have been able to do that, but Fitchburg was one of the last full-on rebuilds done before the state clamped down. Not sure why they would've been nervous about full-high on that curve, because East Weymouth does it without problems on a much more severe curve. But...they couldn't duck the new law when EW was constructed in '06-07 and had no choice but to take on that challenge. Might be because Fitchburg is, I think, owned/operated by MART and not the T...so much smaller MART's budget burden may have also played a factor on the decision to go conservative with the platform. Neither of these terminal stops are going to be priorities until the horrible state of ADA compliance on the Fitchburg, Franklin, inner Haverhill/Reading, and inner Worcester Lines starts getting addressed in giant leaps and bounds multiple station renovation projects at a time. It would simply be irresponsible to shovel more money first at already-compliant stations unless the given station is in some other dire need of repair work that auto-triggers the state law's level boarding mandate by default. Too many totally inaccessible stops still malingering with no accessibility plans whatsoever to jump the gun to secondary priorities like making the Lowell platform dwells +1 better. The Worcester line platform at Back Bay would be a good place to start. Elevators are already in place, and the "temporary" platforms, which looked pretty permanent, were high level. It would improve dwell and allow conductors to focus on fare collection. BandA wrote: The Worcester line platform at Back Bay would be a good place to start. Elevators are already in place, and the "temporary" platforms, which looked pretty permanent, were high level. It would improve dwell and allow conductors to focus on fare collection. Not sure, but the general-purpose station renovation that's queued up for construction (a.k.a. "the fumes fix") may trigger the clause in the current state law for settling up that platform. Though I haven't heard specifically if that's on the docket for BBY. Dwell management is WAY higher-priority in the terminal district, though, so it's hardly an outrage if that BBY mini-high gets upgraded to full compliance before..say...Lincoln. On sheer orders-of-magnitude numbers the partial accessibility at BBY is going to inconvenience far more riders with accessibility needs than any non-accessible intermediate out in the suburbs ever will. Law doesn't give them a choice anymore but to bump up accessibility if other non-related station repairs or improvements hit some trigger threshold, so that's the mechanism for which some already-accessible stations will pre-empt non-accessible stations in getting full-highs. Not a case of backwards priority so much as the law being clear about triggers, and deferred maintenance from basic repairs not being any sort of honorable excuse for ducking the responsibilities dictated by the law. In all other cases, though...yeah, take care of the non-accessible backlog first so the system isn't such an inequitable contrast of "haves" (e.g. all southside non-Worcesters and Franklins) and "have-nots" (Worcester, Franklin, Fitchburg, Reading, those inexplicable Lowell outliers like West Medford). The Lowell platform pretty much was a mini high at first. In 1998/99 it was extended about a car and half. I always assumed Fitchburg station was to do with the curve. Although the mini high itself is on the curve and is curved! Cars crash into all the time. It will be interesting dragging an entire set into everyday. As built though only the engine passed that mini-high. The end of the track was extended when the mini-high levels were added North Leominster to allow the first car to be spotted at the Boston end. The EGE wrote: Since Lowell is a terminal, it won't negatively affect dwell time. That seems like it'd be an incredibly short sighted reason given how service to New Hampshire has been on and off the table for decades now. It was even designed to allow for through-trains. F-line to Dudley via Park wrote: Lowell was built in 1983 when the only full-highs that existed on the commuter rail were Malden Ctr. and Oak Grove, which were only built that way to facilitate future Orange Line conversion. That long ago there was no set specification on how to do one, so they more or less made it up as they went along and built Lowell with that weird half-high/half-low. No sense attempting to explain today a design decision that was finalized 10 years before the ADA and a good 8 years before the T's next attempt at a commuter rail full-high. '83 was still deep in dark ages for accessibility design and consistency therein. I guess this here really says it all. It is incredible how "new" high-level platforms are to the system. If they knew they were going to go bilevel, they could have standardized on those low-ish platforms. BandA wrote: If they knew they were going to go bilevel, they could have standardized on those low-ish platforms. No, they couldn't, because it wouldn't have played nice with Amtrak and all the full-highs they had to run through west of New Haven and in 3rd rail territory. There would've been a permanent incompatibility to kludge around for Amtrak and commuter rolling stock if all CR service north and east of New Haven adopted an 8-inch platform standard. While in absolute terms I guess you could make the case that it would've been cheaper to build Amtrak a separate set of full-highs at the few stops that overlap rather than upgrade everything to 48-inch, administratively the states saw more strength in numbers and federal funding sources by adopting the Amtrak specs across-the-board. It's consistent with how they've marched lockstep with Amtrak design standards on everything else as the Northeastern passenger network has modernized itself over the last 30 years. Ever since the first round of ambitous NEC improvements were kicked off in the early-80's the member states have been very consistent about traveling as a pack with Amtrak when it comes to adopting standards. Of course more money is needed for follow-through on the stations still lagging on compliance, but there's a strong case to be made that standardizing on 48 inches was the best deep long-term decision the northeastern states could've made. Full-highs are superior to 8-inchers in very high-frequency settings or when co-mingling with intercity growth; it's why CAHSR adopted it and Caltrain has decided to trade up to it. There are very few freight clearance routes left in these parts where the mini-high exemption comes into play at all, whereas the Class I freight overlap is much more extreme in the Midwest, West, and South on the highest-trafficked passenger routes and places much more value on the 8-inch standard for seamless traffic compatibility. The Virginia state line is the only place with a significant local/regional train schedule passing between the "official" 48-inch and 8-inch territorial divide, which may someday require Northern Virginia and VRE to switch to 48 in. with a big wad of federal conversion $$$. But as long as the flow of money gets re-loosened up for another across-board ADA push to keep the compliance overchurn going, the overall northeastern passenger rail network ends up with superior functionality at a 48 in. spec instead of 8 inches.